Okay, I admit it…it’s still a tad shy of true tomato season here in Northern Virginia. I try to wait until August, but I just can’t. 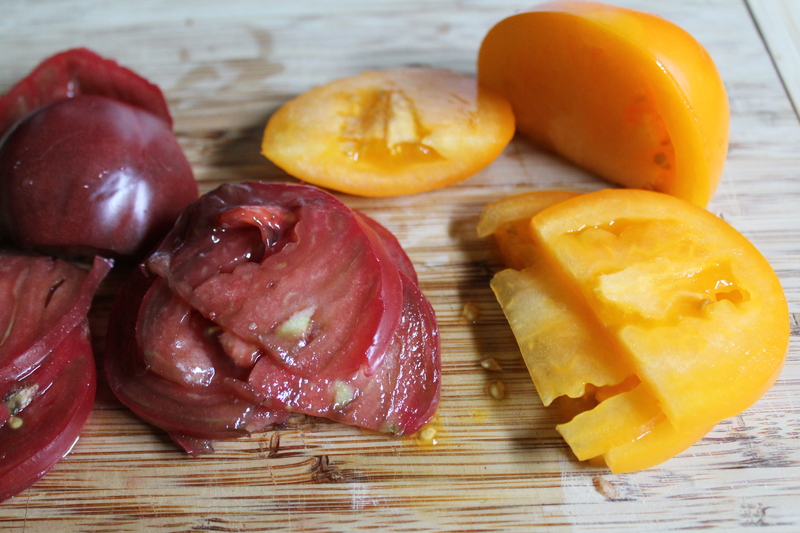 My trick is to buy whatever is available at the farmer’s market (if you see me, I am the awkward one smelling all the tomatoes to see which ones are the closest to ripening…) and then I let them finish ripening on the counter over the next week or so before cutting into them. We have been investigating the various local farmer’s markets more thoroughly this year (last year, instead, we got most of our produce from our CSA share), and I must say I feel blessed to live in an area where they are so prolific. Almost any day of the week I can find a few small farm stands open within a 20 minute drive! After visiting several markets, though, I have to say that my favorite is still the Saturday market by the Fairfax Courthouse, because there are so many farmers and so much variety that I can always find the best fruits and veggies (and flowers and breads and sandwiches) for the best price. This tartine really couldn’t be easier to pull together, but it does require two ingredients you may not find in your pantry: roasted garlic aioli and truffle salt (I bought mine at Chelsea Market on our recent NYC trip!). 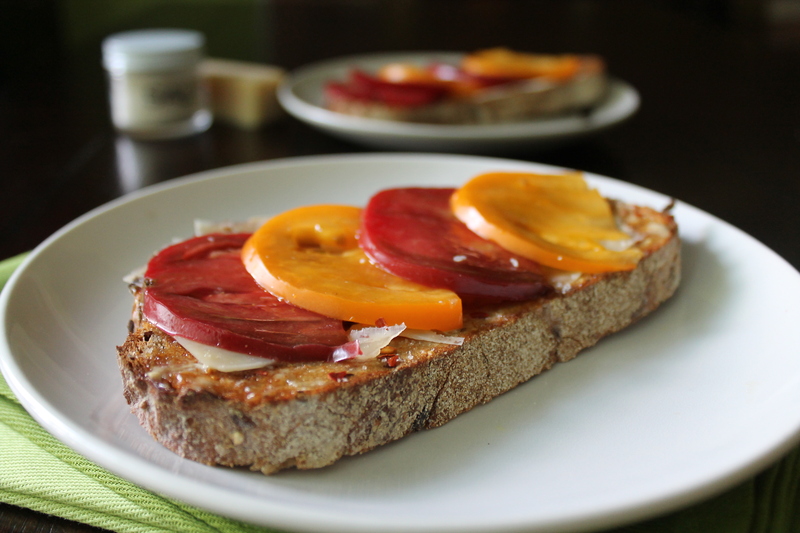 You can totally make a yummy tomato tartine without those things! You could rub your toasted bread with fresh garlic, you could use a few drops of white truffle oil and a flaky sea salt. Heck, you could just do something else. But you would be missing out: the garlic that saturates the toasted bread and the hint of salty truffle over the tomatoes is heavenly! This is one time when I really do recommend splurging a little. 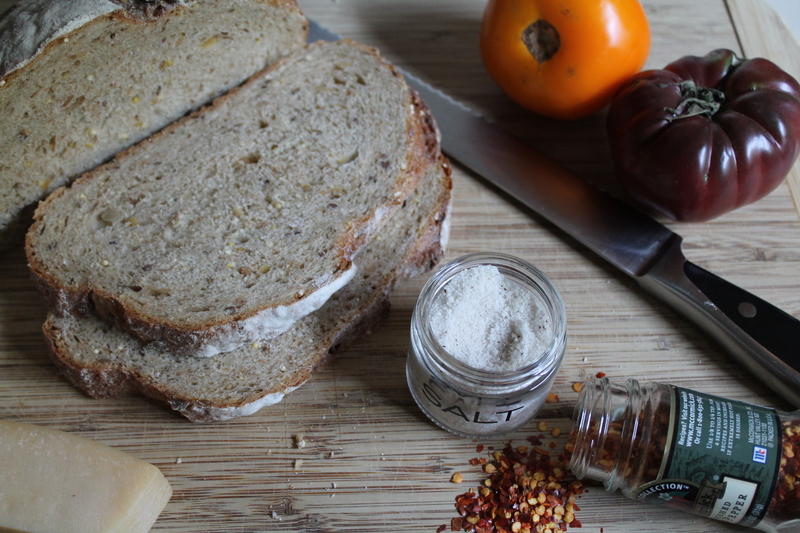 Because sometimes something simple, like a tomato sandwich, really can become something amazing. 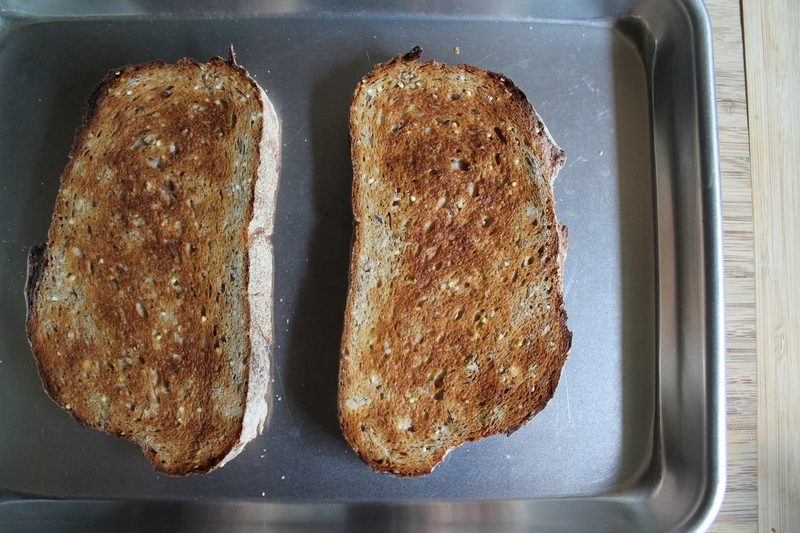 I start by lightly toasting a few slices of artisan bread in the broiler. Of course, you can use the toaster, but this whole grain bread I bought at Eastern Market was too wide for my toaster so…broiler to the rescue! If you broil, I recommend leaving the bread dry for this particular tartine (as opposed to brushing with olive oil or rubbing with garlic or any number of awesome bread-broiling tricks). Simply set the slices on a baking sheet and broil for 2–3 minutes per side, depending on how intense your broiler is and how close your baking sheet sits to the heating element. As soon as the bread is toasted, spread a small amount of roasted garlic aioli on it. The heat will melt the aioli into the bread, which will be just divine. If you can’t find garlic aioli in the mayonnaise/mustard section of your grocery store, then…I’m sorry! Just kidding. If you can’t find it, then I would recommend rubbing the hot bread with half a clove of garlic and then quickly spreading a thin layer of unsalted butter on the bread to melt. One of these days I will make my own garlic aioli to share, since it has become my favorite condiment, but for now, I really like this one from Stonewall Kitchen. Sprinkle with as much or as little crushed red pepper as you like. I like a lot, personally. The heat of the crushed red complements the earthy sweetness of the ripe tomatoes. 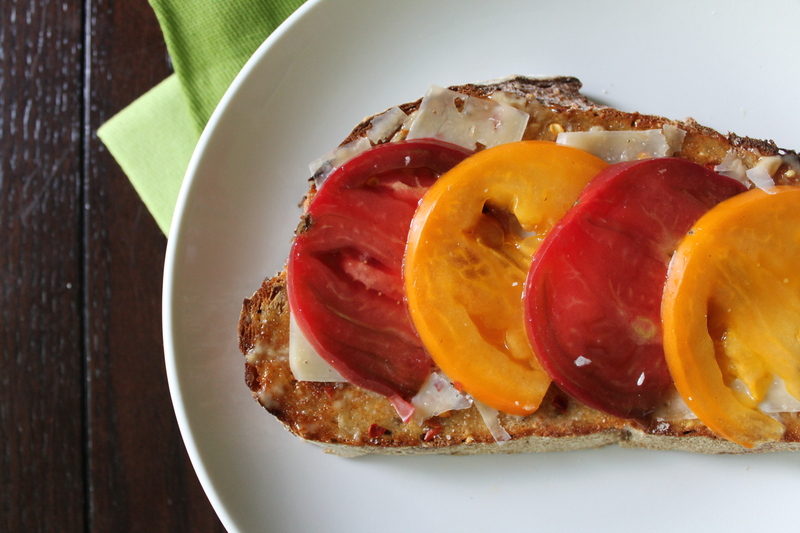 Lay thinly sliced tomatoes, any variety you prefer, on the bread. I am really into purple Cherokees this year (and I am growing some, yay! ), and they have been plentiful at farmer’s markets in my area. I also went with some bright yellow tomatoes for a pop of color. 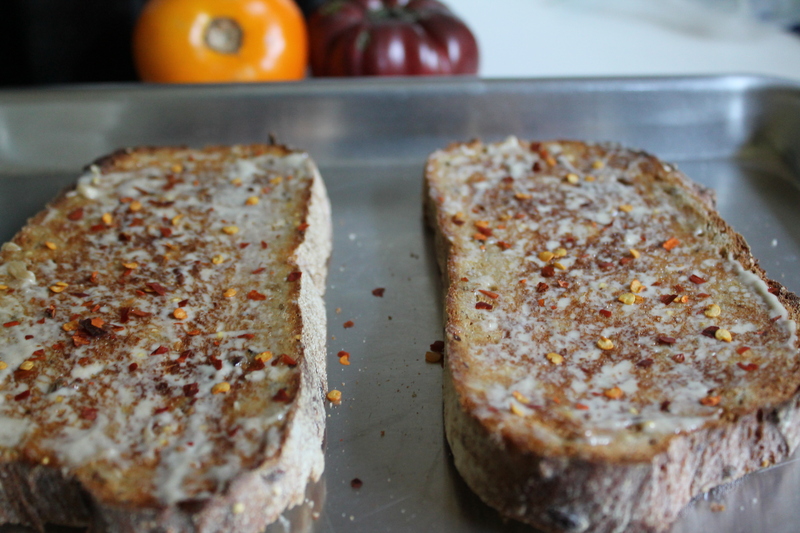 From about a foot above the tartine, sprinkle a pinch of truffle salt over the tomatoes. (You could achieve a similar effect with a few judicious drops of truffle oil combined with a very light sprinkling of fine or flaky sea salt.) The salt will begin to bring out the natural juices and flavors of the tomatoes, and the truffle will just taste like heaven. Yeah. Heaven. Truffle oil has been getting a really bad rap on cooking competitions lately…and maybe it is about as trendy as sun-dried tomatoes these days. But I still love it! And now that I have gotten my hands on truffle salt, well! Just get ready tastebuds, because you are going to be pleased. Shave a little fresh parmesan over the tomatoes (you can use a different hard cheese if you prefer, perhaps something in the aged Swiss family) and you are ready to eat! The still warm bread against the cool tomatoes and cheese, the spice of the pepper and salty truffle against the tangy sweetness of ripe tomatoes…best lunch ever made in 5 minutes or less! Toast the artisan bread until golden. Immediately spread with garlic aioli and sprinkle with a pinch or two of crushed red pepper. 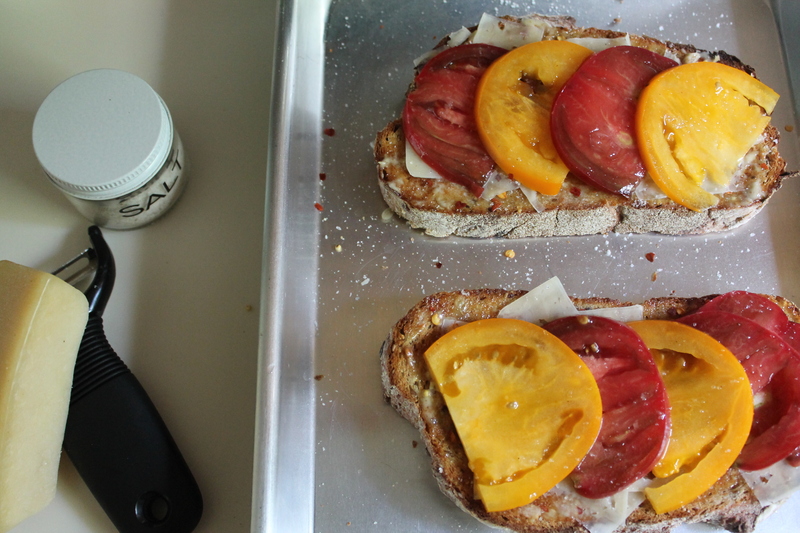 Lay the tomatoes evenly across the top of the bread. Sprinkle the truffle salt over the tomatoes from a height of several inches, so that it evenly seasons the tomatoes. Shave parmesan over the tomatoes. Love, love, love tomatoes!! What a great meal!